Life is all about change, we strive to get the balance right at each and every twist in the road. It will twist and turn because as we evolve personally the path we walk changes too. I was having a discussion with a friend yesterday and we briefly touched on the parenting journey and the choices I and Mr.K took to begin that journey. It took a while to fall pregnant but we decided that if we were going to embark on this rollercoaster journey we would do it all in, which to us was a full time parent and a worker. I still can’t believe how fortunate we were to be able to pursue this path, more luck than judgement certainly! I’m not sure anyone really knows beforehand just how intensive being a stay at home mum actually is; especially with two or more children close in age. For the first 10 years of their lives, yours is secondary, there are no breaks or holidays, you are ‘mum’ 24/7 with, if you can wangle it, the odd gap of 24 hours thanks to the occasional sleep over, even during that time you don’t stop thinking about them. I can only speak from my own experience of course, for eleven years every thought, consideration, plan and decision has put them first. And, you know that’s fine, I spent 36 years before they arrived being ‘me’ or ‘us’ I knew who I was, I remember her well and I can honestly say I’d put ‘me’ on the shelf again to concentrate on being ‘mum’ if I had to re-do it all. Now, as we are on the brink of our next life chapter, with the amazing daughter about to move into secondary school and the little man entering into year 6 and trying to grasp the concept of his first ever year at school without his big sister, it falls on me to consider that in the last three years I have been slowly easing off the mummy shelf and finding small ways to be me again. Obviously, we still have quite a journey ahead of us, the countdown to independence as they go through teen age and spread their wings. But I’m very aware that in this time of showing them how to care for themselves and function in the world I must look toward my place and what that means to me, to us now, moving forwards. Isn’t it funny how life just seems to put people in our paths for reasons? Reasons we may never fully understand. An odd co-incidence happened this week. I think I mentioned in my last post that my daughter is about to leave her Primary education and move up to secondary school. It has, so far been a very smooth transition, she is very happy about it all and looking forward to this new stage in her life. When Mr.K and I decided to be an item we were living 100 miles apart, give or take a few feet. So after a short while we stuck a pin in the map in between our two locations and rented a bungalow to see if we might rub along without killing each other. (Almost 21 years later, he’s not dead yet.) We were in the bungalow 2 years and during this time Mr.K had to hire a new ‘mate’ to work with him. Let’s call him Mr.I… Mr. I and Mr. K became firm friends and through the years and many changes they still are. We went to each other’s weddings, saw five children come along between the families, when they left the country for a bit we visited them abroad and got caught half way up a mountain in a monsoon. Although we have never been in each other’s pockets, especially with the children attended different schools, we muddle along well together and I’ve always enjoyed Mrs. I’s company. So, the daughters school… 250 children in her year 7 – approximately, divided between 6 ‘houses’ which is split into half so each house has 2 timetables, then split further into tutor groups that contain children from each year… 3 year 7’s including her. One of which is Mr. I’s second son… Totally random; But amazing none the less. Yes, it’s a co-incidence but the two families just keep getting further and further intertwined. Also in her half of her house is a young man who we met when she was just weeks old because they were born on the same day. Not such a close connection but still, a half of a sixth of 250 is pretty amazing even if I’m too thick to work out the odds! And to think I was pleased when our closest friends son was in the same house as her! So, that had my little brain reeling. I’ve always maintained that no one ever crosses your path without a reason, sometimes the reason is so small as to go unnoticed, some people are sent to hurt you, some to make you stronger, some to love you, some to make you wake the hell up… It’s all a web of intricate bonds. Changes, changes… 2018 is turning out to be a bit of a roller coaster ride, but in a good way. This morning I had a surge of contrary thoughts as is my way and, also as is my way, I just wanted to vomit them at the computer screen. It helps me to get it all straight in my head, it always has… However, these thoughts were fairly random but not something I could ‘release into the internet’ under any of my current guises: Until I thought of you dear readers. Is it time, do you think to re consider where this blog fits in my life now? Because, to be honest, that has been the problem in the last few years, I couldn’t see how it was of ‘use’ to me. Although I think it might work this time. I started writing again in February… Words came spewing, venting of emotions, some harsh, some whimsical, they spiralled out of me splashing across the screen in a mad ejection of thoughts. Poems mostly, it’s a start I thought and I was right, I’ve tried hard not to force myself to write letting the whimsy take me where it will, no pressure. Why February? Well, I think I’ll put that credit at my Doctors door for sorting out the total mess that had been happening since 2011 and my bumpy ride with early onset menopause… That and a couple of other personal factors. It feels like an epiphany, an awakening of a sort. Long may it last. So, here I am with my muddled head of contrary thoughts and a place that might be suitable to vent them? I wonder… I feel, right now, that in so many ways I am in a transition period. I’m not the first, I mean how many books, films and documentaries are there about women needing to ‘find themselves?’ As much as I’d bl**dy love to f*ck off to Greece for a month like Shirley Valentine, it’s not going to happen, I’ve not so much ‘lost myself’ as I just kinda put ‘me’ on a shelf for 12 years and now I’m trying to find out if I still fit. My darling girl is about to end her primary school career and is flexing the fingers of independence, my gorgeous boy has feet the same size as me and is almost as tall, he has to face his first school year without his sister around and secretly he’s hating that thought. The husband is finding his feet driving a desk rather than a van but is very good (bossy as all hell) at managing his people. Which leaves me… No longer required as much for the everyday fire fighting that first almost 12 years of motherhood have demanded. My solution? (Yes, I do have one) I’m off to London on my own to just be. It’s all booked as much as I want it to be, hotel, train… I’m escaping to the city to spend some time with myself. To go to the V&A, maybe the national gallery? Maybe see a show? Maybe sit in Covent Garden and drink very expensive wine and watch the world go by? Maybe stay in bed until 10am and get crumbs on the sheets? I don’t know, I’m not planning anything because if it’s just me, I don’t need to, do I? No ‘Mum! I’m hungry/bored’ ‘Can we have?’ no worrying about Mr.K not wanting to eat curry if I do (he’s easy going to be honest but he’s still my third child and I want a time out of caring). An epiphany if I ever had one. Perhaps this is something I can share with you? Here in this space? That would be good. Its time for a mind ramble..
It’s not like I haven’t tried to write, although to be fair to me (which I do try to do, even with a propensity to be too hard on myself.) life moves so fast and I’m often pulled in so many directions that my head spins. As each day closes I remind myself to feel blessed that I reached the end of it with everyone I love safe and well. Compared to this, this full life of “stuffs” the need to write is just a niggle which I file mentally under “Things to do next week” along with printing off my endless back log of digital photos and actually doing some housework. Sometimes the niggle is louder, so I muse on Facebook. Short, sharp often humorous (I hope) status updates observing the latest thing to tickle my fancy, the niggle is short-lived, easily placated and gets burried as I’m pulled into the next thing, endless refereeing, creating culinary masterpieces (scoffs loudly) school runs, evening clubs (theirs not mine, I have no social life! ), preparing for trips, ironing work clothes, watching them display their latest achievements on the trampoline… and I do so love it all. It’s good this life. A pause button would of course make it better. Today I find myself with a little extra time due to school play rehearsals, so I thought, get on with it, and then I thought, I have nothing to say. This discussion has ended my writing aspiration so many time I can not even begin to calculate, it may even have happened daily since my last post… Today I decided I would tell you this. Which makes today a very different day indeed. In most respects its been a very normal Wednesday! I get more head space on Wednesdays as a rule, the small people have a woodland wander to school which means I get to drop them off earlier. After a brief logistical chat with one of my most fabulous friends, about various to-ings and fro-ings of children I headed home to coffee and i-pad time before work. I work part-time and this morning was a quiet one with friendly customers and chats about camping, puppies and the inability of any human to multitask. After work I wandered through the town running the odd errand, indulging on my favourite pass time of saying hello and exchanging news with people I know, spreading smiles. I was even brave enough to say hello to someone I thought I recognised from Instagram! (It was her too! which is even lovelier.) On arriving home I was greeted as usual by the black and white ninjacat, aka Twinkle, who has mellowed with age to being passably polite to most people and occasionally loving towards me, the food provider. Lunch was an indulgence of goats cheese and chorizo and then I found myself facing the dilema – I could clean/wash/iron/vacumn/sort/tidy etc or I could crochet/sew/read/game etc or I could write…. Guess what won. Life changes. Gone is the need to tweet to maintain adult contact in a world filled with nappies and peppa pig. No more, the desire to invite the world of the internets to know my every movement and dinner, it seems. I never was one for selfies. The daughter (now 10, I know, when the hell did that happen!) is adverse to my sharing her picture or doings on a web site (and I repect that) so any drivel I do splash onto this page about the smalls needs permission, although its usually granted. The cats, adoreable as they are, are much the same as anybody elses. I never did write much about Mr. K as it would end up being a moan (possibly) and I’m much too loyal to mouth off so publicly about his good self. I find myself a little bereft of subject matter. So please forgive me if another year or so passes before I darken your door again. We had a little bit of snow, not much at all, enough to create much excitement! It’s the fastest I’ve ever managed to get the little lady out of bed! 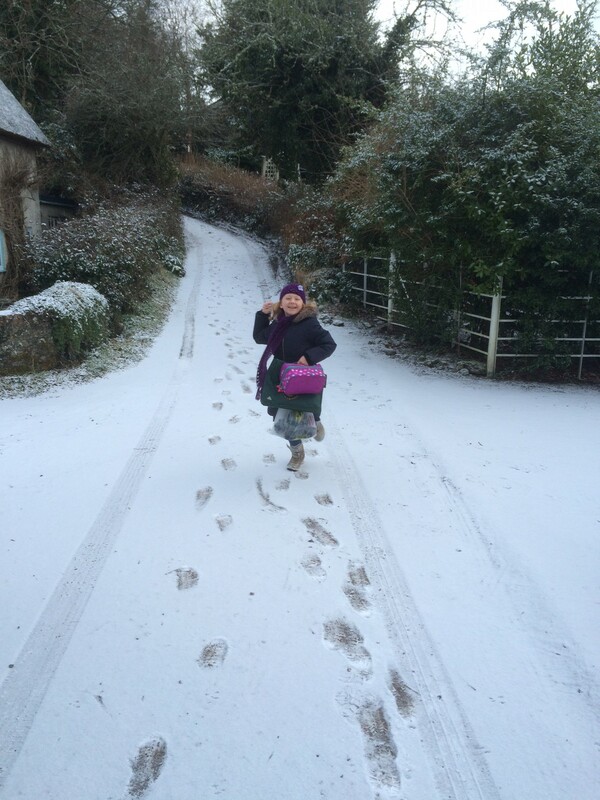 She spent ages in the garden playing with the snow before school. The little man is not so keen but got carried away by his sisters enthusiasm. 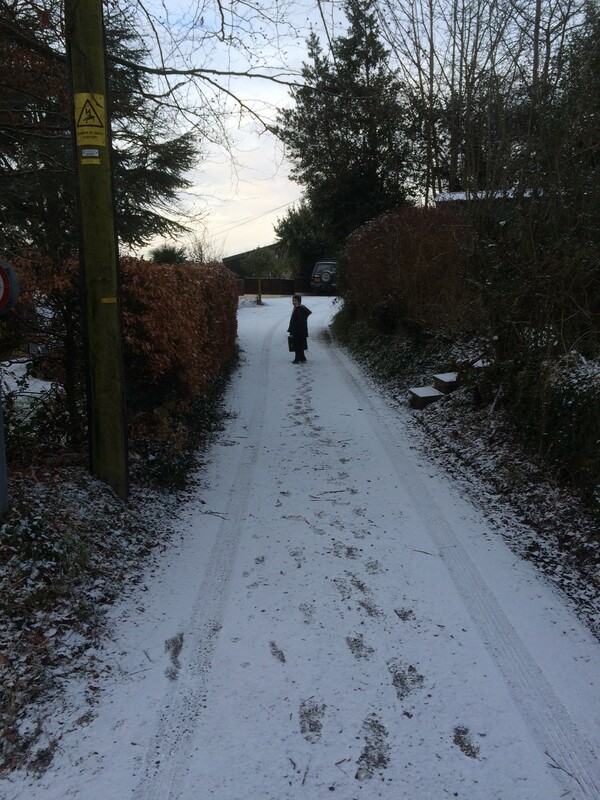 The school run was a trauma, the council don’t grit the road leading to school and its rather steep in places. We had icy conditions with cars sliding and traffic backed up rather fast. It was my day for traffic management, so I left my car at the top of the hill and walked down with the smalls. I was pleased I did! Ours is only a small school but everyone drops off in 20 minutes, its usually a well oiled machine but ungritted roads are a bit of a nightmare. A little bit of snow causes so much havoc in the UK but I still love it to bits! 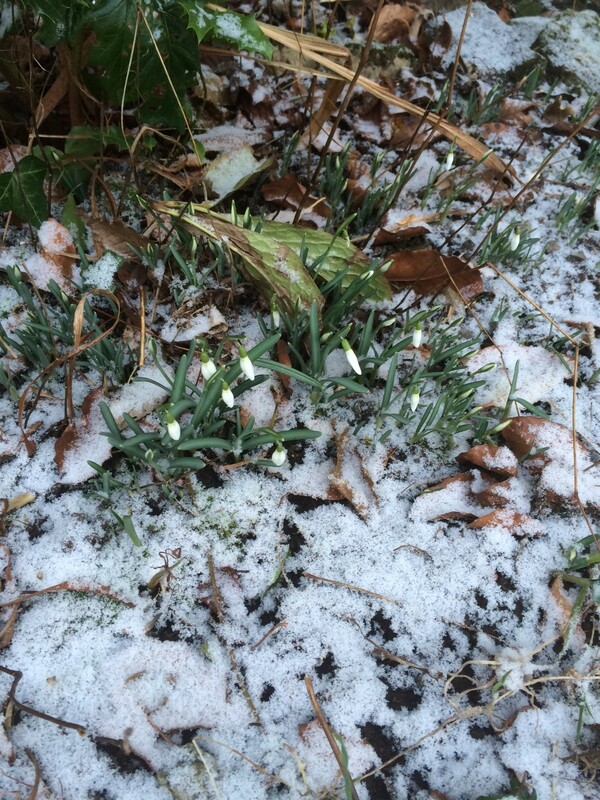 We had to pause to take a picture of the snowdrops, it’s become rather a tradition, the first flowers poking their head out after the dullness of December, it’s the hope of new life they bring. We stop, huddled together and proclaim over them every year. Beautiful. I hope you are staying warm and safe and enjoying the snow (or your own weather) wherever you are! !